I've spoken about and shared list poems a couple of times before but I really don't think we can have too much of a good thing. List poems, done well, sing to us because of their deceptive simplicity: they wear the disguise of an ordinary everyday thing (shopping list, to do list etc) but the poet's choice of form and language lifts them up out of the ordinary and makes them extra-ordinary. 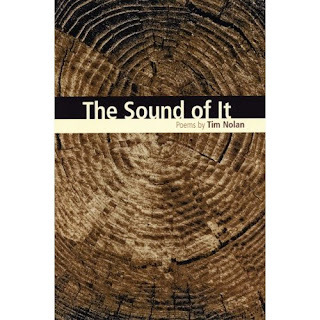 for Tim's collection, The Sound of It. What do you take from that penultimate couplet and the final line on its own? Inevitability, acceptance, understanding? I take comfort from it; repetition in all its guises can be comforting. Although my comfort is tinged by inquietude. I'm not sure I want another long winter, I'm not sure that I want some things to happen over again. But I also know that my experience of life is deepened by living through change. Poems that make us think, that shift us between different emotions, these are the ones to cherish. I don't want to be prescriptive with a poetry prompt. Let this poem work on you through several readings then set out on a journey of your own.